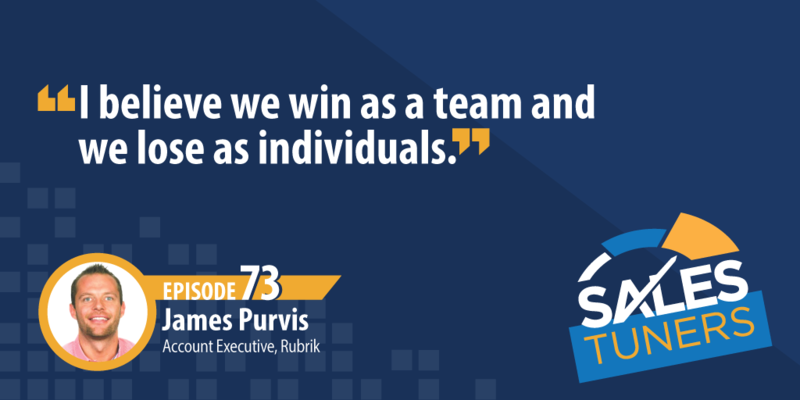 After becoming the number one sales rep in the world for his previous company, James Purvis (@JamesWPurvis) joined Rubrik, a cloud data management platform, as an Account Executive. While he is no stranger to hyper-growth technology sales, James started his career selling premium suites for the Denver Broncos. Growing up in a home of entrepreneurs, James was taught early on to sell the experience. Now in his sales process, he has adopted his mother’s mantra of “people don’t buy what goes into the product they buy what comes out.” His passion for the products he sells empowers him to land those critical face-to-face meetings. James leans into the idea of utilizing all resources available. One of those resources is customer references. At the end of the sales conversation when a customer says “the price is just too high.” James response, “compared to what” allows him to go back to the value while gaining more context. He can then leverage those customer references to overcome the price objection. Get Something in Return: Whether it references, case studies, access to your C-suite, or proof-of-concepts, there are only so many things we have in our bag as sales reps. So, before you give away the farm for customer requests, make sure you’re getting something in return for each ask. Overwhelm the Prospect’s Request: Once you decide it’s time to send over references, overwhelm them with your approach. If they ask for two, give them four and do it as fast as possible. This shows that not only do you have 100% faith in your product, but your existing customers do too. Bonus tip – this also works in the prospecting stage. Send over testimonial quotes from existing customers who are in a similar industry. Leverage as Many People as Possible: James considers himself a resource hog and wants everyone in his company to know about every deal he’s working on. With that, he’s able to align his CEO with his prospect’s CEO, his VP of Technology to his prospect’s VP of Technology, any subject matter experts that are relevant to the opportunity and obviously as many customer references as possible.